Growth- and Lifespan Growth- and Lifespan depends on temperature and the amount of feed. 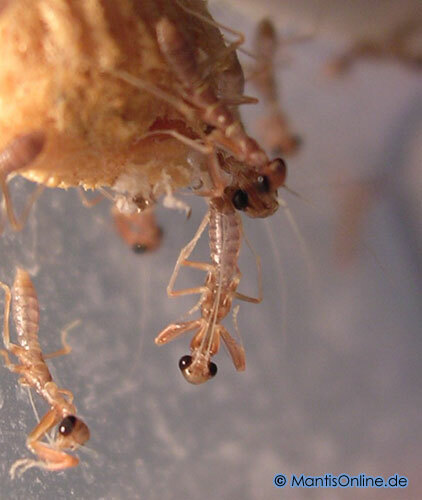 A cooler climate leads to a slower development and a longer lifespan of the nymphs, as well as a lack of feed. Sometimes a further larva state is interposed if the lack of feed is intense. Thus the growthspan can be retarded strongly. Therfore you can retard the growth of male nymphs, which often need 1- 2 moltings less than females. But pay attention, that the temperature will not differ to much from the optimum temperature. Growth This issue will not be examined extensively or scientifically. In fact own experiences will be reflected. The larva-states are mentioned as "Lx", the "x" stands for the number of the actual molting-state. At the hatching the nymphs are named as L1 (until yet no molting). 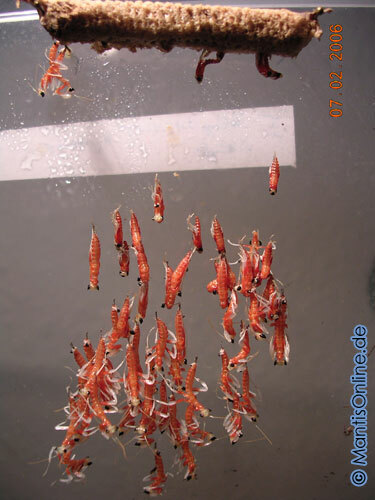 Shortly after the hatch, the nymphs molt for the first time, so they are "L2". Thus a freshly hatched "ready" nymph is named as "L2". Every molting increases the number. So a "L5"-nymph has moulted 4 times. 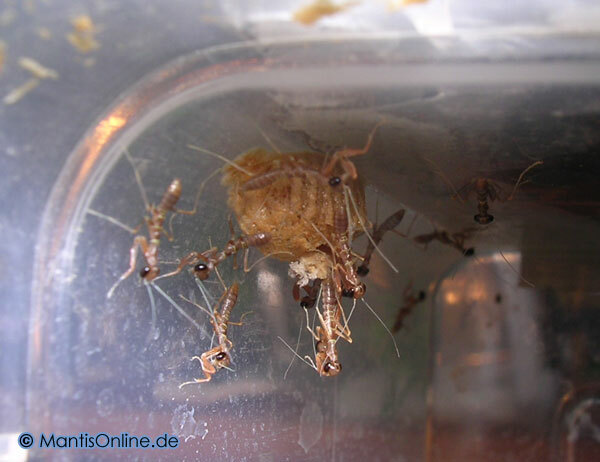 In principle, the development of the mantids starts with the development of the eggs in the adult female. The eggs look like rice grains. Depending on the species, the growth of the eggs starts days till weeks after the imaginal-molting. Thus the abdome of the female gets bigger and she is more omnivorous, so you have to feed her more often. A soon as the eggs are ready to be fertilized, the female starts to secret pheromones. She is bending her abdome to the ground to spray the pheromones. At this time the female is ready to mate and the copulation should happen. 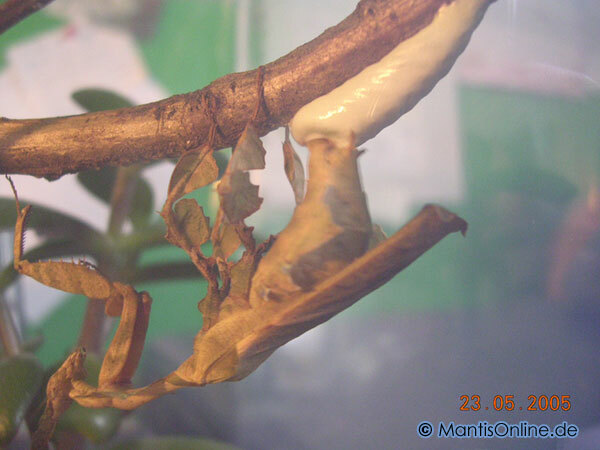 After the successful copulation the eggs are fertilized and a new generation of mantids starts to develop. An exeption is the parthenogenesis, where no males are needed for the reproduction. Mostly one copulation is enough for several ooths, this is because females have a reservoir for the sperms. Some days till weeks after the copulation (depending on species), the female starts to lay the eggs. 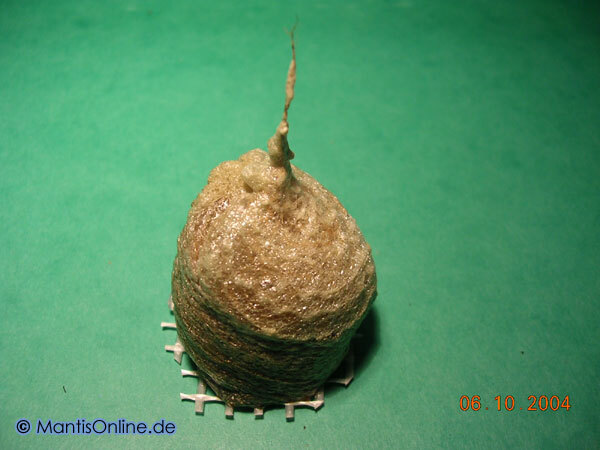 Therfore she builds a so-called "ooth" (ootheca), an egg mass. The eggs were not layn seperately but within a foam of protein which hardens into a tough casing for protection. The ooths differ variously from species to species in form, colour and size. Also the contained number of eggs differ. The growth of the embryos takes now place beyond the female within the ooth. An ooth is constructed in layers. The female excretes a foam and handles it with the end of her abdome. Then one or more eggs are layed in it. With the foam these eggs were covered, then again eggs will be layed in. This procedure repeats several times until all eggs are layed in. Then the ooth has to harden. The building and hardening of an ooth can take several hours, depending on genus and species. The time the embryo needs to develop depends on the temperature, intensely. Cooler temperatures cause a longer developing time, accordingly a higher temperature a shorter time. But the incubation-temperature should be in the typal scope. In the majority of cases, the incubation-time takes 4- 6 weeks. Another criterion is the humidity. Depending on the origin, the ooth is more or less permeable for water. So the humidity has to fit to avoid the drying-out of the embryos. If all conditions are fulfilled, the mantids hatch. This happens in the wee hours of the morning or in the late evening, mostly. 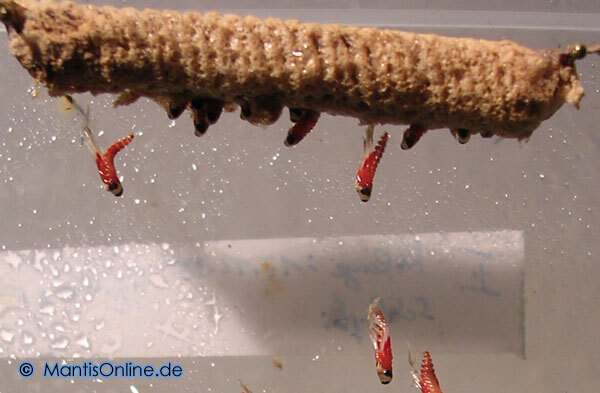 The hatching nymphs look like worms and are called pre-larvae. 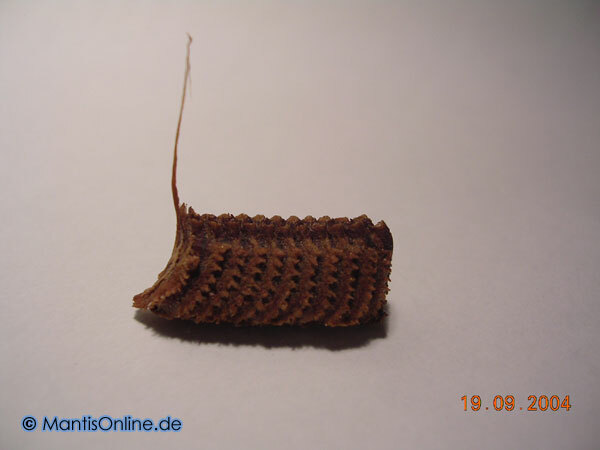 During the hatching the larvae slip out of the ooth slowly, when they are out they lower themselves on a "rope", which is often 3 or more times longer then the pre-larvae. (There are also exceptions which do not "roping".) This larva-state is called "L1". Straightly after the "roping", the pre-larve molts and she has the mantid-typical look. 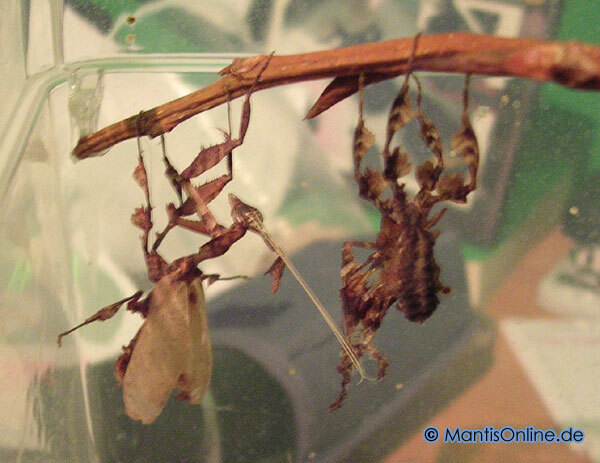 After this first molting, the nymph is called "L2". As soon as the nymphs have hardened, they run away in all directions. From this time on, they have to stand on their own. The hardening-time of the chitin-carapace can take several hours. The next molting occurs 10 days after the hatching, mostly. During the growth, the larva molts several times until it is adult. 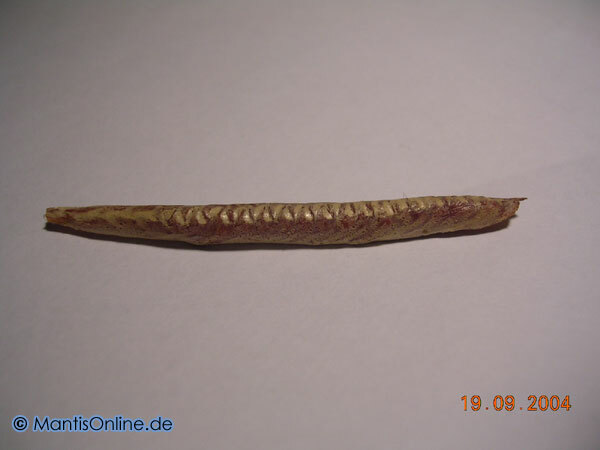 The number of moltings and the time which the animal needs to growth is typal scope and depends on temperature and feed. The state befor the last molting is called "sub-adult" (if this is not the correct term in english, please write us!). You can see the rudiments of the wings. 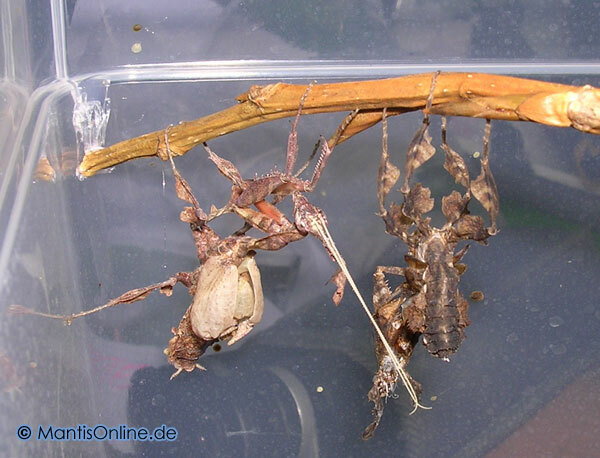 When they lift up from the abdome, the final molting is imminent (more information: s. "Molting"). Now the last molting happens, the so-called "imaginal-molting". This molting differs from the previous ones, because the wings have to unfold. Larvae are easy to distinguish from adults, because just adults have complete developed wings. 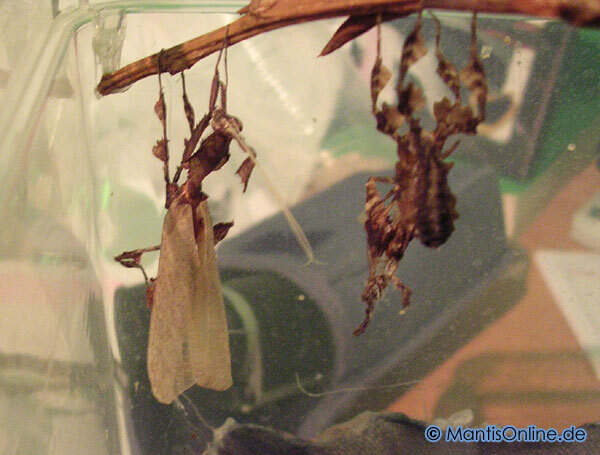 After this imaginal-molting the mantid is full-grown, no more molting follows. This is the adult state and the animal is called adult or imago. Now the sexual maturity is achieved and the growth is completed. Note: Mantids from cooler habitats have a diapause, where the growing stops/ lags. For more information look at "Ventilation/Temperature". The optimal temperatures and humidity for the development should be taken from the origin/ habitat of the mantid, if its known.